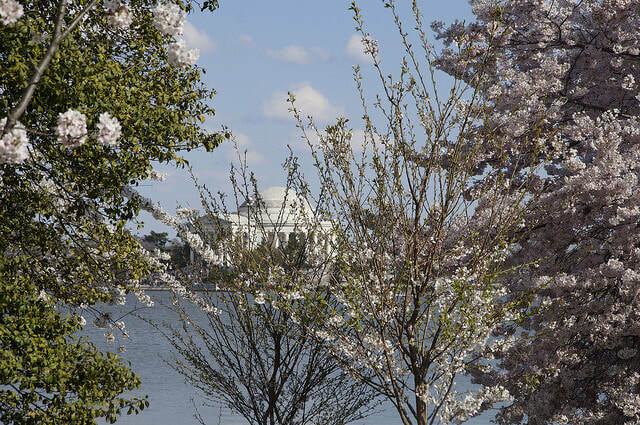 Each year, the National Cherry Blossom Festival commemorates the 1912 gift of 3,000 cherry trees from Mayor Yukio Ozaki, originally from Ise, served simultaneously as the Mayor of Tokyo, to the city of Washington, DC. The gift and annual celebration honor the lasting friendship between the United States and Japan and the continued close relationship between the two countries. It took the coordination of many to ensure the arrival of the cherry trees. Since First Lady Taft’s involvement, the nation’s first ladies have been proponents of the Festival. Historically, many were involved in events through the National Conference of State Societies’ Princess Program. First Lady Mamie Eisenhower crowned Queen Janet Bailey in 1953, and in 1976 Betty Ford invited the princesses to the White House. In 1965, First Lady Lady Bird Johnson accepted 3,800 Yoshino trees from the government of Japan and held a tree planting reenactment. All first ladies in recent years have served as Honorary Chair, many participating as well. In 1939 the first four Cherry Blossom Queens were selected by the Cherry Blossom Festival Committee of the Washington Board of Trade for the years 1939, 1940, 1941 and 1947. NCSS started selecting Queens with the random spin of The Wheel of Fortune in 1948. There was no Cherry Blossom Festival in Washington, DC for the years 1942 - 1945 due to World War II. In 1951 the festival included Cherry Blossom Princesses from overseas Embassies. This tradition continues today. In 1954 the Japanese Stone Lantern was presented to Washington, DC as a gift to commemorate the 100th anniversary of America’s first treaty with Japan. 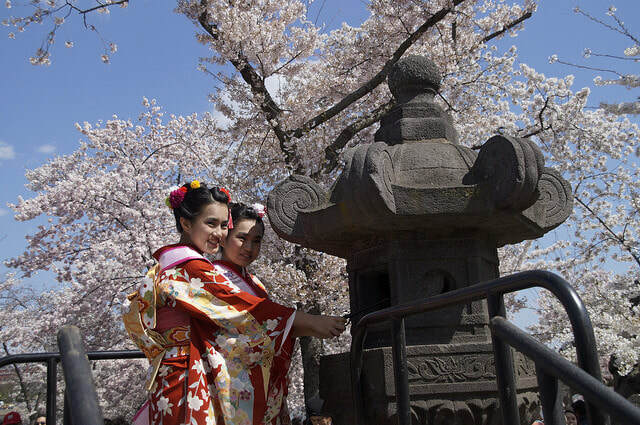 It is lit only once a year during the Cherry Blossom Festival by the Cherry Blossom Princess representing Japan. Standing 8.5 feet tall and weighing approximately 4,000 pounds it was carved nearly four centuries ago to honor the Third Shogun of the Tokugawa period. It stands 50 feet east of the first two cherry blossom trees planted by First Lady Helen Taft and Viscountess Chinda in 1912 and is on the National Register of Historic Places. The Mikimoto Pearl Crown, named and created by the famous jewelry company Mikimoto, the official jeweler of the emperor of Japan. He donated the Crown to the U.S. in 1957. The crown was constructed with over two pounds of gold and has 1,585 pearls personally selected by Mr. Mikimoto and they are set in a frame of 14K gold. The crown has a 6-3/4 inch base that is encircled with a band of ermine. Above the base is a coronet of perfectly matched pearls and delicately crafted gold blossoms, scrolls, and leaves. The most recent appraised value of the crown in 2005 for insurance was $300,000 but in reality the crown is priceless because of its unique design and history. The crown is kept in a bank vault and brought out for one day during the festival. Jean Marie Lee of Alaska was the first Queen to wear the priceless Mikimoto Pearl Crown in 1957. Because of its weight, the young lady who is crowned Queen will wear the famous piece for a few brief moments while pictures are taken. It is then removed and the Cherry Blossom Queen is given a smaller crown, also a gift from Mikimoto, that is hers to keep forever and ever! The smaller crown is brought to the U.S. by representatives of the Japan Cherry Blossom Association and the small crown matches the one worn by the Japan Cherry Blossom. 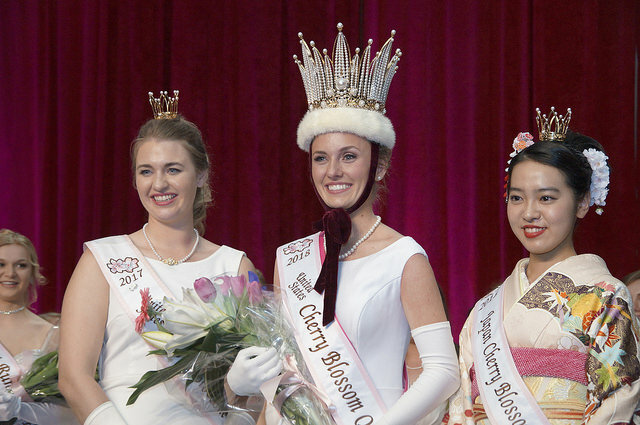 Mikimoto also presents necklaces and other jewelry to the nationally selected Cherry Blossom Festival Queen! In 1972 Cherry Blossom Queen Lynn Armstrong of Massachusetts leads a section of the parade in a brand new Ford Mustang. About 52 new Mustangs and drivers for state princesses that year were donated by Ford as a new car promotion. Following this the Princesses and Queens have participated by riding floats in the parade ever since.